In this day and age of lighters, kerosene, and arsonists, starting a fire is not actually that hard to do. When camping, however, a certain degree of status and tent village celebrity is reserved for the woodsman who gets that campfire ablaze. 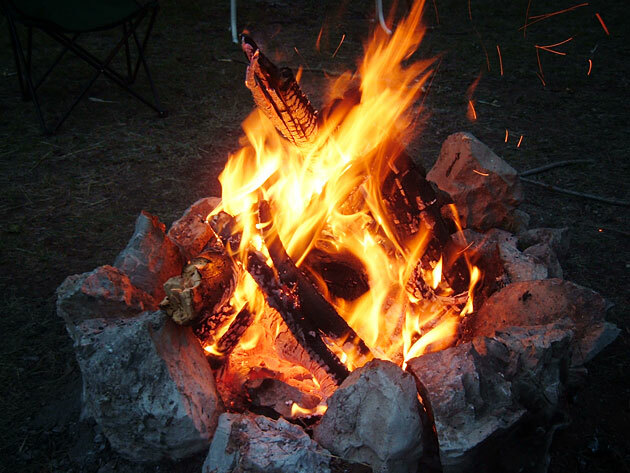 The fire is the lifeblood of the entire campsite. Without it: no cooking, no warmth, no light, and presumably, no protection from cougars and bears. Until it’s lit, everyone is in danger, and once it’s crackling, an enormous sense of relief and awe descends onto the entire campground. This, perhaps, is why the Fire-starter is so revered. As the Bearer of the Blaze, you must know your surroundings. Which pieces of wood will burn, how much kindling do you need, which section of the newspaper is nobody going to want to read this weekend and can therefore be used as an ignitor? Be sure to create your pyre with care because you only get one match. Using a second match is to forfeit your cool altogether and admit that nature has defeated you. A good fire is a nice little reminder to nature that humans are in charge! This entry was posted on July 4, 2010 at 11:04 am and is filed under skills. You can follow any responses to this entry through the RSS 2.0 feed. You can leave a response, or trackback from your own site.